Always a joy to be working the idyllic grounds of Hellens near Much Marcle. Every year the beautifully tended house and grounds are the setting for a Garden Festival open to the general public. 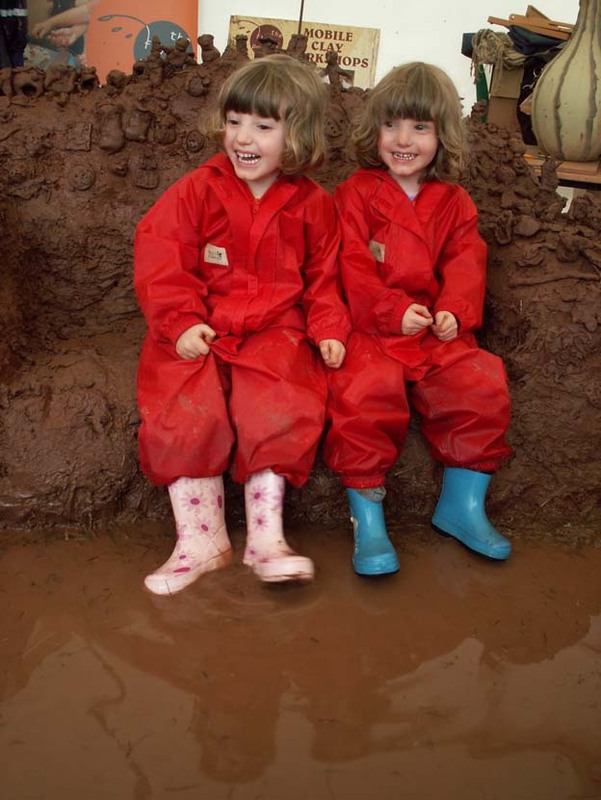 More often than not we’re asked to provide ‘make and take away’ clay workshops for young visitors and their families. This year Aimee and Immy were in attendance on the Saturday and Sarah took up the reins on Sunday. Over the two days, countless participants made pinch pot fish to take home to paint. Here’s a small selection left with us whilst their makers enjoyed the rest of the show without having o lug their creations around with them. Pleased to report all the fish were collected at the end of the event. 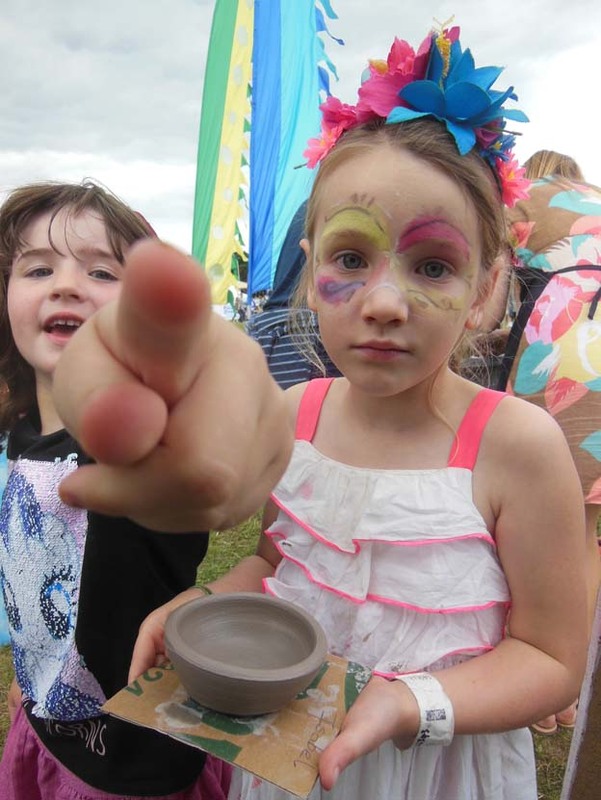 As the Autumn evenings draw in and thoughts turn to indoor pursuits and activities, here’s a timely reminder of the clay, sun and summer fun we had in August at Lakefest. We offered drop-in potter’s wheel sessions to festival goers, working with approximately 100 or so families and individuals over the weekend. We also took some lovely pics. 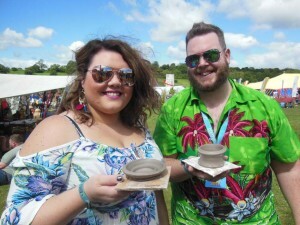 We’ve been on the festival circuit of late providing top quality, fun and engaging pottery sessions for guests and visitors at some of the most reputed events in the UK. At the tail end of May, we spent three busy and enjoyable days at The Hay Festival of literature on the Herefordshire/Wales boarder. One of the global themes at the Festival was ‘Trees’. Graphic designer and kids zone producer Aine Venables produced stunning branding and motifs made up of stylised bows, birds and foliage. 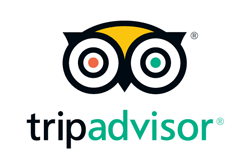 This was displayed through-out the festival site and on promotional material and signage. In discussion with Aine, we proposed a collaborative project where by participants co-create clay trees adorned with hand modeled bugs and forest creatures. By way of introduction, I threw a pot on the potter’s wheel, the form rapidly turning into a tree trunk before the appreciative audience. The accumulative results looked amazing, especially once we added hazel twigs to simulate the branches. Families and individuals squashed clay leaves to the branches to complete the visual effect. By the end of our three day residency we had produced no less then x9 collaborative trees with an abundance of woodland creatures peeping out amongst the undergrowth. 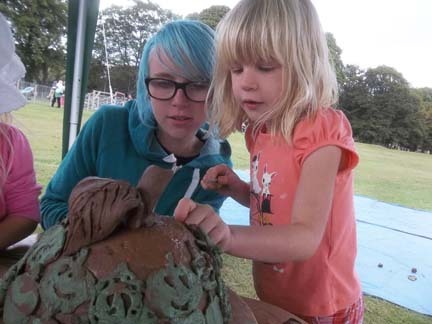 We love it when participants bring their own interests into the clay modeling and if one scruitenised the collaborative work, you might well encounter the odd t-rex, unicorn and tractor! 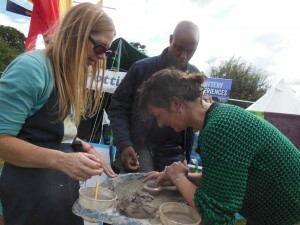 A few days later we found ourselves at the Cheltenham Science Festival working with quite literally thousands of children and families all eager to try their hand at clay work. We had been invited to facilitate clay sessions in the MakerShack, a large, interactive space with separate stations and a host of different science related activities for visitors to engage with. We were situated next to the digital printing stand – pointing up the similarities between ancient clay construction techniques and those of the ultra modern. 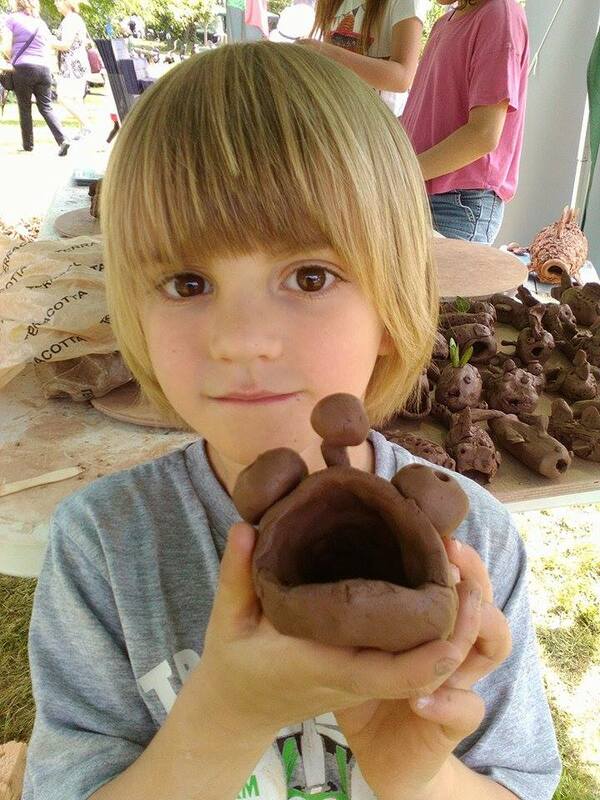 We encouraged visitors to our stand to make mini coil pots by curling thin rolled snakes of clay around a small paper cone. The digital printers created 3D form by layering synthetic material. Very similar making techniques – just different tools! The residency at the Science Festival lasted six days and we helped approx 1000 visitors a day create coiled cones and watch them transform into penguins, flowers and elephants to name but a few project interpretations. 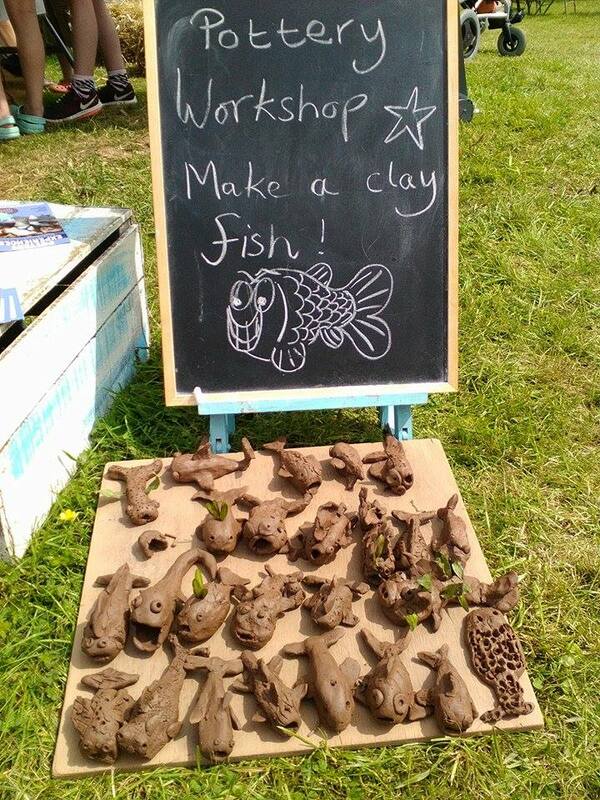 For those of you familiar with our work will know we have a busy summer of workshops and pottery sessions ahead of us. 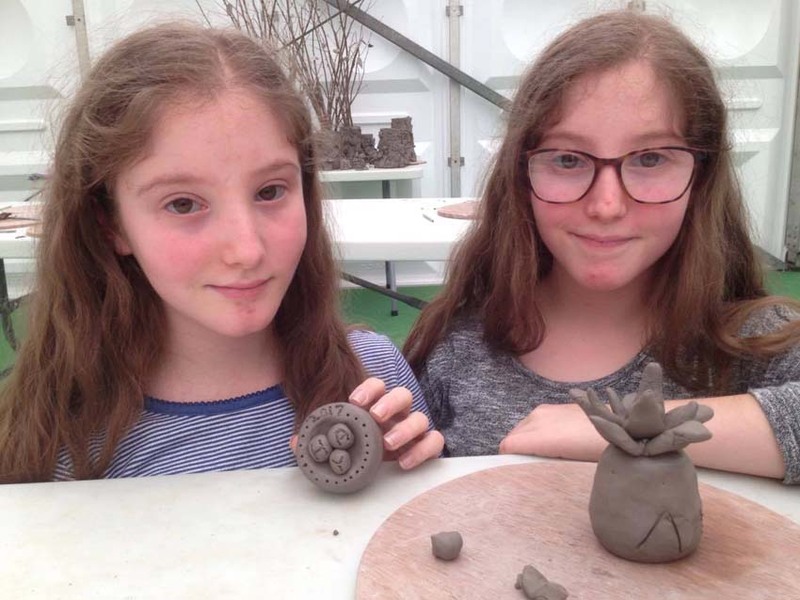 We will be sharing the many benefits of working with clay, not only from our idyllic Herefordshire studio, but out in the community at festivals and events. We love getting out there and enjoy the challenge of working with large numbers of participants in fields, community halls and public spaces. Here’s a list of public events we’ll be present at in the coming months. We hope to meet some of you on the campaign trail Summer 2017!